An Australian by the name of John Rendall is about to release a new book (his first was published in 1972) about the time he and his friend Ace Bourke shared their lives with a lion called Christian. 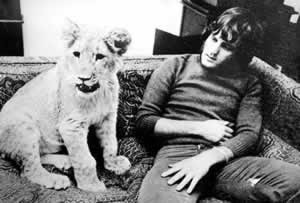 John and Ace bought the lion cub from Harrods Department store in London in 1969 (in the days it sold exotic animals....and obviously before the animal rights movement was born). Christian's parents belonged to a zoo in England. While living with John and Ace he travelled by Bentley, ate in fine London restaurants and spent his days lounging in a furniture shop. Christian was beautifully behaved but he grew from 35lbs to 185 lbs within a year. He was fast becoming a problem which was growing every day. It was clear he could not stay with his owners forever. His future was decided by a chance encounter - when the actors Bill Travers and Virginia McKenna (remember they starred in Born Free?) walked into the shop to buy a pine desk. They immediately suggested that George Adamson, the African conservationist might be able to help. John and Ace took Christian to Africa in 1970 even though George had warned them that Christian may not be able to be rehabilitated back into the wild because of his lavish urban lifestyle. John Rendall and Ace Bourke continued to make sporadic visits to Kenya, but mostly they followed Christian's adventures from afar. Finally, in 1974, George Adamson wrote to say that Christian's pride was self-sufficient. Christian was defending it. There was a litter of cubs. They were feeding themselves and they rarely returned to camp. John and Ace decided to travel to Africa one last time, in the hope of being able to say goodbye, although Adamson warned them that it would almost certainly be a wasted mission. Christian hadn't been near the camp for nine moths and George didn't know if he was alive or dead. John and Ace decided to make the trip anyway. Strangely, Christian turned up at the camp the night before they were due to arrive. That visit was to be their last and Christian has never been seen again. The following is a video of John and Ace's reunion with Christian a year after they left him with George in Africa. If you would like to read a 2007 press story about Christian click here or if you would like to see a recent interview (1.8.08) with John and Ace click here and here . A truly heartwarming story. I would love to read this story because true love can be actually find out in books only,in present times. I saw these videos, very touching. I won't admit to tearing up, but I to get the sniffles all the sudden. There must have been a cold going around ahem. It's amazing that the lion, after being back in the wild would remember them and treat them the same. Let alone introduce his wife. I love this story, Lilly. It moves me to tears and joy and reaffirms Life and possibility for hope and joy and wonder. Thank you for sharing it. I'd seen the video but loved reading your writing here. One thing I learned in the Australian rainforest (among many things) was that we humans grossly underestimate the intelligence of our wild brethren. We (as a collective) are beyond myopic in our concept of wildlife, we are almost retarded when it comes to our perception of who and what they are, what they feel, understand, remember, know, perceive and are capable of sharing and teaching. It is truly tragic and one of the things that allows us to destroy them so easily. If we allowed ourselves to see what they REALLY are it might make it much harder to decimate them. Oh- you put me in tears with this video. Born Free was my favorite movie of all time as a kid. Great Post. I saw this story on quite recently on local television. It really is amazing that the lion should remember him after so many years. It was not only a joy to behold, it is a totally heart warming story. I saw these guys being interviwed over a week ago on Kerri-anne, they are gorgeous mature men now who have done a lot for animal conservation and George's trust - he was killed 14 years after this video. There is also a movie made by the actors in Born Free about Christian which was done in the 80s maybe. You Tube is a great thing for bringing wonderful stories to the masses. Genius idea that was. words are powerless in frot of such display of love and pure feelings from animals that are most of the time referred to as beasts. thanks Lilly for this beautiful clip! @ Affiliate Marketing - Ah, trule love exists everywhere...keep looking. @ Eric - You love animals Eric so you would understand the bond beter than most. Just beautiful watching the reunion though. Robin - "If we allowed ourselves to see what they REALLY are it might make it much harder to decimate them". You have such a beautiful way with words. I cannot wait for your book to come out. So wise are you ---and I guess with your experience you would totally understand the animal/human connection. @ Redchair - I loved Born Free too! It's a great story. @ Jon - the video was of them meeting the lion after one year but apprantley they went back a few more times after this - every time Christian would unexpectedly turn up at camp the night before they arrived. @ Sarah - the interview of these gus some 35 years after was interesting - great to see all the worl they do for wildlife conservation too! @ Rocksnowhite - thanks for dropping by - you have been posting some fantastic writing lately!! I was doing fine (okay, maybe tearing up a bit) until I watched the video and listened to the Whitney Houston's singing that I completely lost it. I'm such a baby when it comes to these kinds of stories. Thanks for sharing. I must admit that I haven't seen this before. This is very moving and very touching, indeed. Christian, Ace, and John are all extraordinary. Couple of corrections for you; it's Ace Bourke (Anthony Bourke), not Ace Berg. The hugging video is Ace and Christian, not John Rendall. These videos absolutely amazed me and made me weep! I remember hearing about this tale of love between these two men and Cristian during the 70s and was so moved! There could be such a bond between humans and all animals if we afforded them the dignity that is theirs by right. I have a 'thing' about zoos and aquariums. When I see a magnificent creature caged up in a pen less than one thousandth of a percent in space of its natural habitat, it makes me want to scream! I've seen full grown horses that have spent their entire lives in a 10 X 10 pen standing hock deep in their own excrement. What is it in 'humans' that allows them to rationalize this? I realize that there are some endangered species that are part of an effort to save them in zoos and parks. But this, too is unnatural to me. Having observed animals much of my life, I believe the 'wild' to be much more humane than our own species. Oh piddle! This started out as such a gentle comment and ended up as one of my animal advocate diatribes! I need another coffee and more time awake. Wow- what a different world we live in now- selling lions in department stores?! Would love to read the story and was thrilled to see the lion adjust to its natural habitat. Good for them for returning him to the wild. I honestly loved that story. Thank you so much for sharing it with us. I cried like a baby! well , true love exist . I disagree with affiliate.... . It exists. Wow! What powerful videos. Thank you, I will look up the story it sounds fascinating. I remember watching this and it really hit me close, it was awesome! I hope you okay .You have been such a support to me. I remember seeing the videos. It was heart-warming and reminds us that love can survive, no matter the changes, no matter the nature ~ love is real. Thanks to everyone who has made a comment. Sorry I could not reply sooner as I have had the flu over the past few weeks. I appreciate all your comments and for stopping by and reading my blog! A friend sent me this video a few months ago via email and it moved me to tears. It's amazing how the lion can have such deep connection to the men that not even years can take away. I am very touched by this story and was so glad it turned out okay, your post is very well written, thanks for sharing this story with us. Thanks Margaret for dropping by - yes its a truly wonderful story - its good to hear the positve sories.